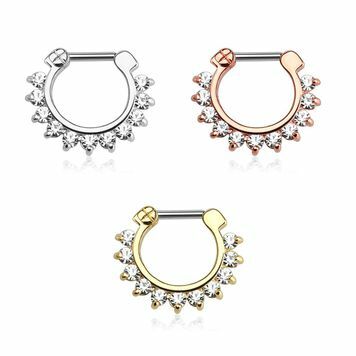 This beautiful item features a fan design septum clicker with single lined paved gems. Available in 14G and 16G, and can be used in multiple piercings. Made of surgical steel and ion plated with your choice of gold, rose gold, and silver ion plating. There is no other item like this. Order yours today!